Just because something IS, does that mean it OUGHT to be? Given the breathless rate of societal upheaval in America these past 2 years, the IS/OUGHT fallacy seems to be the modus operandi of the current ‘Culture Nazis’. In short hand – If something exists, it should exist. But is that true? And if so, then on what basis? What grounds or serves as a foundation for this premise and conclusion? If my two-year old granddaughter makes a scene when her parents deny her every wish, should she throw a tantrum just because that is her ‘natural’ or default response? Just because she screams, should she scream? Can we say that something is wrong or right? Or is personal preference what supports our decisions? What’s the difference between those is-ought statements and the following? The first two affirmations are now accepted by a segment of our US population. The last two claims more folks might question. But the reasoning in all 4 if-then statements is the same. When a people no longer submit to law or when the law becomes watered down so that it can be stretched to mean whatever one wants, then anarchy ensues. Even if my country is becoming unmoored and applying false reasoning to justify personal preference, Christians have an authoritative foundation to guide and ground their decisions. What a relief. As a Christian, my parameters of what is the good and acceptable are detailed in the teachings and commandments of God. He is my creator and I belong to Him. So I defer to His wisdom and His wishes for me. Many Americans seem increasingly to prefer a decision-making model that leaves them like drifting ships with no anchor. In reality, without any authority in their lives they are actual prisoners of their temperamental or fickle feelings. Hurricane Sandy in NJ + a summer-like North Carolinian day in February + unusual rain this past summer in our local area . And from these 3 events, he concludes – “Something is wrong “. So how does a logical gal or guy start to think about this man’s argument? The best place to start is with TERMS. Labeling one’s assessment of evidence as a “MORAL action“ caught my eye. Hmm…better see how ‘moral’ is defined. Dictionary.com defines ‘moral’ as distinguishing between right and wrong conduct….in the context of what is customary for a culture. Moral derives from ‘mores’ which are the practices of a culture. Our letter writer who happens to be a pastor (maybe that’s why he has introduced the language of morality?) seems to be saying that how one evaluates evidence and arrives at a conclusion can be considered morally RIGHT or morally WRONG. He seems to rely on the alleged consensus of a large group of climate scientists. In essence his reasoning is based on majority thinking. If one sides with the majority, then one has made a morally correct assessment. But should the opinion of a large group of scientists be the basis for policy change that might have an even broader impact on our world than that of climate change? (think economic repercussions) These are tough issues that demand clear thinking. I’ve been greatly helped by a book whose author, Greg Koukl, is a mature radio show host and head of an organization devoted to good reasoning. On his show, Greg discusses questions with callers in the area of ethics, values and religion. 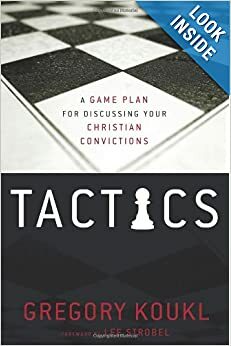 The fundamental principle Greg teaches (and writes about in his book Tactics) is this: Whoever makes the claim has the burden to demonstrate what he means and how he arrives at his conclusions. I think I would enjoy meeting face to face with the local pastor who exhorts his fellow newspaper readers to ‘right this wrong’. After listening to him defend his argument, I would ask him to identify his authority and to explain how he knows that this person or persons are right? After all, has a majority of smart people ever been mistaken? Don’t scientific theories come and go? Before we instigate sweeping policy changes in one area, we need to study potential effects on the larger system, namely our country and the world.